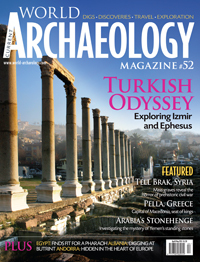 Izmir province, located on the Aegean coast of Turkey, bristles with archaeology: evidence of human occupation is abundant throughout the region, which has been settled since earliest times. The city-port of Izmir was known until 1923 as Smyrna, and today it is the third largest city in the country. But Smyrna’s political and commercial success in antiquity is its archaeological downfall. While Pergamon and Ephesus were abandoned and lay undisturbed for centuries, Smyrna has been continuously occupied, burying its past with each successive generation. But that is changing. Areas around the Roman agora have been cleared for excavation, and archaeologists are uncovering its substantial remains. Surprisingly, quantities of graffiti, on a scale that rivals Pompeii, were also revealed, providing a unique insight into the thoughts, worries, and humour of Smyrna’s citizens. On the west of Izmir Gulf lies the Ionian city-state of Clazomenae, which thrived in the Bronze and Iron Ages but fell into decline just as Smyrna grew in strength and influence. Nearby at Ephesus, archaeologists are piecing together what is arguably the world’s biggest jigsaw puzzle: the painted frescoes and marble panels from the houses of the town’s elite. These residents clearly enjoyed a life of considerable comfort and style. A very different story for our next feature: prehistoric Tell Brak in Syria reveals a gruesome story of civil unrest violently crushed by the authorities. Sound familiar? Mysterious standing stones in Yemen’s semi-desert Tihamah Plain were only recently noted by archaeologists. Though this ‘Arabian Stonehenge’ was known to the local farmers, their presence was unknown to outsiders – until now. Their origins, however, remain an enigma. In the final part of our series exploring Macedonia’s capitals in Classical Greece, Andrew Selkirk visits Philip II’s palace at Pella, the school where young Alexander the Great was taught by Aristotle, and the lavish tombs at Mieza.esence was unknown to outsiders – until now. Their origins, however, remain an enigma. A chance find of exquisite chariot leathers in Egypt, the latest news from around the world, thought-provoking comment, and travel destinations all provide plenty to mull over and digest this issue. I hope you’ll agree, it’s a jolly good read!